Skills required: casting on, knitting, purling, decreasing, knitting in the round, working a stranded colorwork pattern in the round following a chart, picking up stitches, binding off. 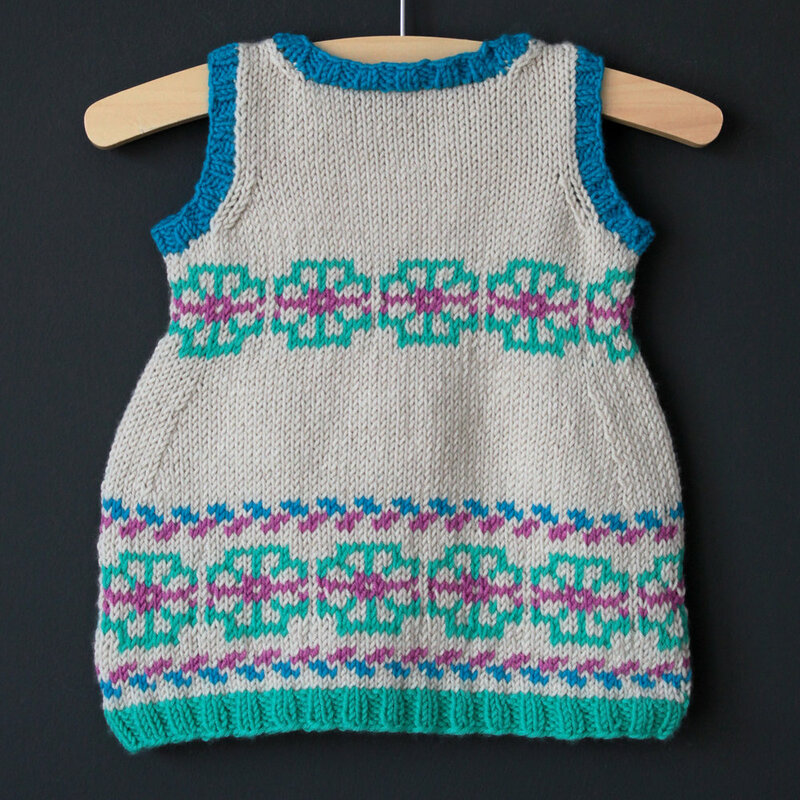 Construction: This garment is knit seamlessly from the bottom up, featuring two stranded colorwork sections, one at the hem and one at the chest. The skirt is worked in the round to the underarms, then the front and the back are worked flat. The shoulders are joined using a three-needle-bind off, then stitches are picked up at the neckline and armholes to form the ribbing. Inspired by modern Scandinavian design and the vivid colors of childhood, this jumper dress is happy and unfussy and sure to be a winner with active little girls. As a layering piece, it is practical and versatile, and can be worn as a tunic as the child grows. Using this dress as your guide, select your colors and let your creativity run wild! This stash-busting project is perfect for those who have always wanted to dive into colorwork: there are only 2 colors to work with at a time and it's worked in the round (no stranding on WS rows). Garment chest at underarms: 18 (18, 20, 20 // 22, 24, 26, 28) inches or 45.5 (45.5, 51, 51 // 56, 61, 66, 71) cm. Main Color: Approximately 200 (225, 250, 275 // 300, 450, 550, 650) yds or 183 (206, 229, 251 // 274, 411, 503, 594) meters of Debbie Bliss Baby Cashmerino Colorway Clotted Cream (340065) (55% Wool, 33% Microfiber, 12% Cashmere ; 137yd/125m per 50g/1.76oz ball) or similar sport weight yarn. Contrasting Color 1: Approximately 60 yds or 50 meters of Debbie Bliss Baby Cashmerino in Colorway Sea Green (340099) or similar sport weight yarn. Contrasting Color 2: Approximately 60 yds or 50 meters of Debbie Bliss Baby Cashmerino in Colorway Sapphire (340089) or similar sport weight yarn. Constrasting Color 3: Approximately 30 yds or 25 meters of Debbie Bliss Baby Cashmerino in Colorway Hot PInk (340060) or similar sport weight yarn. 24 sts x 32 rows = 4 inches or 10cm in stockinette stitch in the round after blocking using size A needle. 24 sts x 28 rows = 4 inches or 10cm in main colorwork pattern in the round after blocking using size B needle. Size A: US 5 or 3.75 mm circular needle (or size needed to match stockinette stitch gauge). Length: 16-inch or 40cm, (except for sizes 6yo and 8yo which require 24-inch or 60cm length). Size B: US 6 or 4mm circular needle (or size needed to match recommended colorwork pattern gauge) of the same length. Size C: US 4 or 3.5 mm circular needle (or 1 size smaller than Size A) of the same length for bottom ribbing. Size C double-pointed needles for armhole and neckline ribbing.